BRACEBRIDGE — A tenant complaint that led to a housing complex being “deemed unsafe” by the Town of Bracebridge has upwards of two dozen residents scrambling to find permanent alternative shelter. It is located just off the main street, Manitoba Street, on the north side of the hill street, by the Shoppers Drug Mart and just up from Ball’s Flats where McDonald’s and Horton’s. A housing complex at 19 Monck Rd. has been deemed unsafe, displacing 19 families. As a result, the District of Muskoka, the Town of Bracebridge and Muskoka Victim Services, in conjunction with emergency services, are working to support the displaced singles and families. The loss of 19 units adds to an already grave problem with affordable and attainable housing in the town and across Muskoka. A release from the town April 2 said: “Yesterday afternoon, the building was deemed unsafe under the Ontario Building Code by the Town’s Chief Building Official. “This unsafe order affects 19 of the 25 rental units in the building. 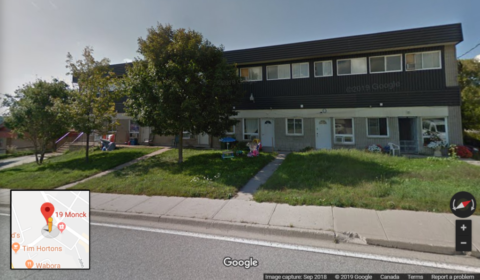 An investigation of the building had been prompted by tenant complaints…. “All individuals or families displaced are being supported or offered immediate shelter and supports through Muskoka Victim Services and the District’s Community and Planning Services department. They said further updates will be provided later as next steps are clarified and longer term strategies are identified. Additional information on how the community can support this emergency situation through donations or short-term shelter will also be provided shortly.